Why book directly with us? We’ve got lots or reasons!!! You get to select your room. You get a smiling voice on the phone to help answer ALL of your questions about the Inn and the surrounding area. Privy to any in-house promotions…i.e., dining cards! Early checkin notification whenever possible. Doing business with the owners, not an offshore reservation system. Cancellations can be handled quickly. No 800# to deal with! BECAUSE, we want to give you BIG hospitality!!!!! At our bed and breakfast in South Haven, Michigan, you’ll enjoy a delicious gourmet breakfast served every morning in the dining rooms or in the summer Garden! Inn at the Park was built in 1996 to look like an elegant Victorian painted lady. Our inn offers everything you are looking for in a luxury lodging facility. Delight in the Victorian elegance and modern luxury of Inn at the Park. Of all the luxury inns in South Haven, we boast the LARGEST rooms and suites! Come and experience the pampering and our famous sunsets. Arriving at the inn, you are greeted by our unmistakable style of luxurious B&B hospitality, unmatched by typical hotel lodging. Our sumptuous Victorian guest rooms are elegantly appointed with cozy fireplaces, TV/VCR, wireless Internet, private baths, some include a soothing whirlpool Jacuzzi, and all have either a king or queen-size bed. In the morning, be awakened by the aroma of fresh brewed coffee and freshly baked breakfast cake and the anticipation of one of our signature breakfast specialties served in the bright, cheery breakfast room. We have been known to surprise you with Lake Michigan smoked Salmon cakes made from freshly caught and smoked Salmon that lived just past our front door… OR how about our Christmas Creme’Eggnog French Toast? Our newest addition is the Garden Bistro where we serve summer breakfast…and where you can enjoy your morning coffee, tea or afternoon adult beverages. Enjoy late evening conversation under the Victorian chandelier and reminisce about the day. You are surrounded by gardens, birds and great food. Our courteous and thoughtful staff is dedicated to providing understated luxury in an elegant, comfortable setting that will beckon you for years to come. Our Lake Michigan bed and breakfast is ideal for enjoying many area attractions. It is conveniently located just a block from Lake Michigan, the harbor, shops, and restaurants of the quaint town of South Haven, MI. Our location is ideal for a weekend getaway, a lavish retreat, or even a romantic honeymoon destination. Park your car and walk to everything. Spend a day or a week at our elegant Michigan bed and breakfast, and you will never be bored. Spring has arrived. I know because I just took the winter wreath off the front door 🙂 but more importantly, I can hear the birds singing and see the robins hoping all over the yard looking for earthworms. Its so exhilarating to smell the earth wake up from a very long, and COLD winter, but its a smell I love. Soon the flowers will begin to throw their fragrance around the yard and guests will begin to sip coffee in the garden or wine by the fireplace. We love this time of year. Previous guests return to enjoy all that South Haven has to offer and new guests are learning why people just can’t stay away! We’ve decided to break the rules! Our 3:00 check in isn’t carved in stone and we will do early check in by request whenever possible. We won’t charge you extra to arrive early because we are as excited to meet you, as you are to get here and start your vacation or other reasons for visiting. We want you to enjoy the Inn and SoHa as much as we do. NEWS FLASH: We have recently purchased another B&B down the street. A Country Place B&B. Its been a part of the South Haven community since 1987 but we have refurbished it quite a bit… our own spin on an HGTV makeover… and have gotten great feedback from the guests that have recently stayed there. It is only open during the warmer seasons so take a peak at this delightful spot and give us a call if you would like more information. Its is a great place for large family reunions as you can rent the entire house and make your own special breakfasts.We are offering weekend stays this Spring & Fall. Give us a call to check availability and pricing. 2 beautiful acres surrounded by woods and wildlife and just 1.2 miles from town. See our current specials and packages page for getaways and add-ons that will certainly be the icing on the cake of your stay with us. 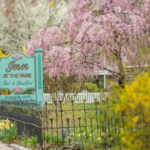 Welcome home to The Inn at the Park!